Home > National alcohol policy Ireland. Ireland. Department of Health. (1996) National alcohol policy Ireland. Dublin: Stationery Office. The National Alcohol Policy is directed at reducing the prevalence of alcohol-related problems through an emphasis on moderation in alcohol consumption. The importance of a comprehensive alcohol policy was highlighted when Ireland endorsed the European Charter on Alcohol in December 1995 along with 48 other Member States of the WHO European Region. The alcohol-related problems are multidimensional, therefore the solutions most be multi-sectoral. This means that commitment to the National Alcohol Policy must be on the agenda of policy makers in all sectors and at all levels. An Alcohol Policy requires both environmental and individual strategies. There is strong evidence that policies which influence access to alcohol, control pricing through taxation and other public health measures, can have a positive impact on curtailing the health and social burden resulting from drinking (Edwards et al. 1994). However, a key to the effectiveness of such strategies is public support, enforcement and maintenance of the policies. 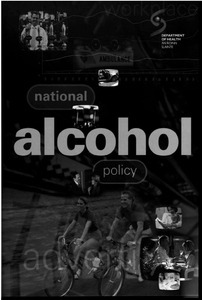 In examining the rationale for a National Alcohol Policy a number of elements have been identified. Research is urgently required to identify attitudes and patterns of alcohol consumption across the population and within sub-groups of the population. Based on sound research, a sensible drinking message of Less is Better should form an educational empowerment programme with regional and local initiatives as a required and integral part of such a campaign. A health education programme in all schools should be part of the core curriculum. The availability and effectiveness of treatment services need to be established. Action to contain the availability of alcohol could be achieved by reducing the number of special exemptions for longer opening hours and controlling access to underage drinking by ID schemes nation-wide. The enforcement of drink driving legislation including random breath testing needs to be continued to reduce alcohol-related traffic accidents. All levels of the Drinks Industry should recognise that people have the right to be safeguarded from pressures to drink. Finally, a National Alcohol Policy could be co-ordinated by a wider National Substance Use Surveillance Unit.